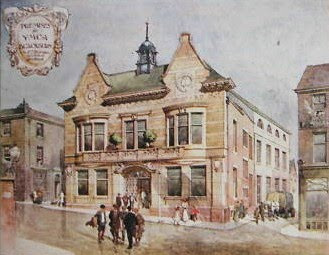 The upper image, is from a postcard which dates to around 1910 and is of the then, new YMCA on the corner of Limbrick and Tontine Street, soon after it had opened. 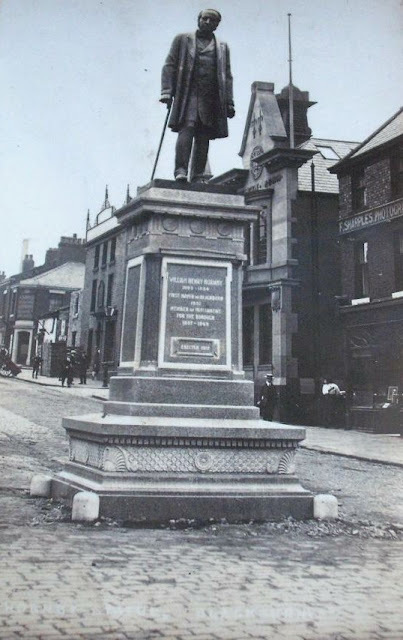 The lower image is the William Henry Hornby statue, which stood for many years, at the foot of Limbrick, looking onto Sudell Cross. This image dates from approximately the same period as the top one and the YMCA building can be seen behind the statue. W.H. Hornby now stands close to the Old Town Hall and the YMCA building, has for many years, been the Sir Charles Napier pub. The building, which in the second (statue) photo, appears to be next door to the YMCA building, where the lamp post and the few people are, is the original Sir Charles Napier pub. It stood on the opposite corner of Tontine Street. Next door to that, was a shop premises (a newsagent in the 1925 directory), then came Kirkham Lane. 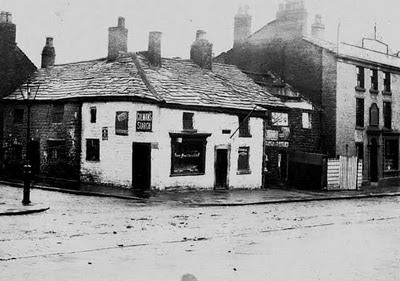 On the opposite side of Kirkham Lane, the doorway with the white surround and sign above it, was a confectioners in 1925. The photo below, taken from another angle, gives you a better view of the original Sir Charles Napier. It's the 3 storey building on the right. The YMCA (present day Napier) would be to the right of that. BLACK & WHITE IMAGES COURTESY OF COTTONTOWN & THE COMMUNITY STUDIES DEPT. BLACKBURN LIBRARY. Your Grandad was right June. I've had do-lally soup in there and in a few other places around the town centre. I was a member of the Drama Club and we used the Theatre at the top of the YMCA. These days it would be totally banned by the 'elf and safety' lot!! It was an intimate and had a lovely atmosphere. Blithe Spirit and The Amorous Prawn were two of the plays and also Billy Liar. Smashing Days. anyone know of any ghost of the napier ?